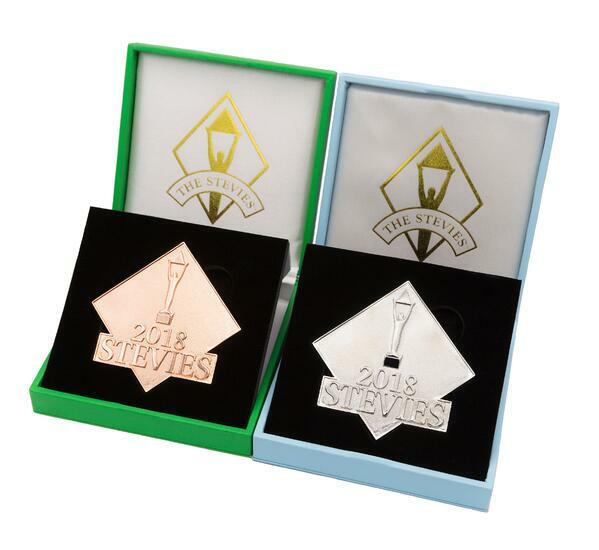 We're pleased to share with you the first photographs of the Silver and Bronze Stevie® medals that will be presented to Silver and Bronze Stevie winners in all of our 2018 competitions. 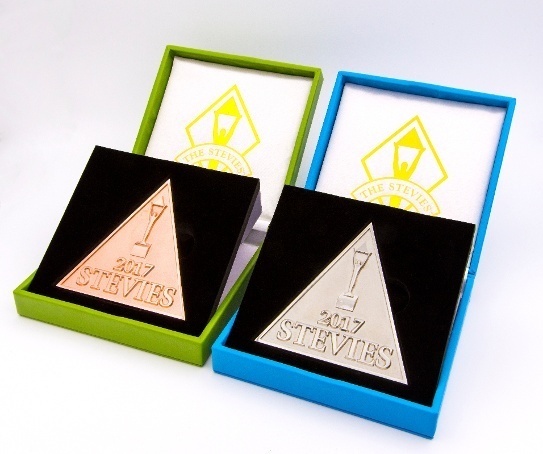 The medals are diamond-shaped, evocative of the Stevie Awards logo, a break from the triangular medals of 2016-17. The Silver Stevie medal will be conferred in a powder-blue presentation box, and the Bronze Stevie medal in a hunter-green box. 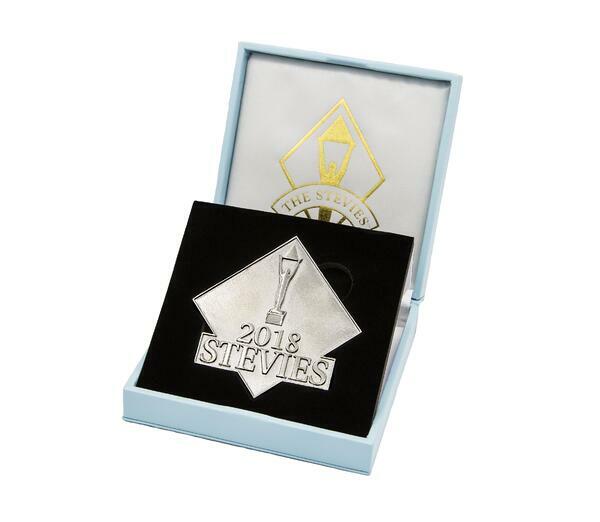 The medals will first be presented to Silver and Bronze Stevie winners at the 12th annual Stevie Awards for Sales & Customer Service in Las Vegas on Friday, February 23. The 11th annual Stevie® Awards for Sales & Customer Service - the world's top honors for customer service, contact center, business development and sales professionals - will be staged this Friday, February 24 at Caesars Palace in Las Vegas. 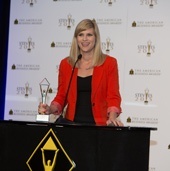 More than 650 professionals from around the world will attend, making it one of the largest Stevie Awards events ever staged. The awards presentations will be broadcast live - look here for the details. Gold, Silver and Bronze Stevie Awards in the business development, new product and service and solution provider categories will be presented at 5:15 pm Pacific Time. After a reception and dinner, awards in the sales and customer service categories will be presented beginning at 7:40 pm PT. Here's the list of organizations that have already confirmed their attendance this Friday. Entries for the 2018 edition of the Stevie Awards for Sales & Customer Service will open in July. Interested? We're pleased to announce that the new Stevie Awards mobile websites are live. 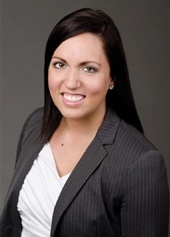 Check them out on your mobile device today, at mobile.StevieAwards.com. That's the link to the main mobile site, from which you can navigate to any of our individual awards program sites. Here's a rundown of the main features of the mobile sites. On the main mobile website you'll find a consolidated calendar of all important dates for all of the Stevie Awards programs. On each of the individual awards program sites, you'll find a calendar with important dates for only that particular awards program, such as the Stevie Awards for Sales & Customer Service. In many cases you'll be able to link directly from a menu item to a page of interest. Every page on every one of our mobile sites now features a Participate Menu in the lower lefthand corner of the screen. Open the Participate Menu to find links to pages about how to participate in Stevie Awards programs, including how to be a judge, how to get the entry kit, how to schedule text-message reminders about the entry deadlines, and more. The Participate Menu on the main Stevies mobile site enables you to perform these functions for more than one Stevie Awards program at a time. On the individual program sites, you can perform these functions just for that individual awards programs. Every page on every one of our mobile sites now features an Awards Program Menu in the lower righthand corner of the screen. Open the Awards Program Menu to find links to the mobile websites of each of our individual awards programs. You'll find links for all six of the Stevie Awards programs that we operate. You'll also find a link to the entry-kit request form for the Golden World Awards for Public Relations Excellence, which we promote on behalf of the International Public Relations Association. We've made it easy now to get an entry kit for all Stevie Awards programs, or just one in particular. The homepage of each of the new mobile sites features a simple form to fill out if you'd like to be emailed an entry kit. Fill out the form on the main mobile site, and you can request the entry kits for any or all of the Stevie Awards programs. If you complete the form on one of our individual awards program sites, you'll get the entry kit for just that particular awards program. This is a brand-new feature that we've introduced with the new mobile sites that we're very excited about. Now you can subscribe to receive text-message reminders six days in advance of all of the entry deadlines for a particular Stevie Awards programs. If you subcribe to this feature on the main mobile site, you'll have the option to opt-in to text message reminders about the entry deadlines for any or all of the Stevie Awards programs. If you subscribe on any of the individual awards program sites, you'll opt-in only for the reminders about the deadlines for that particular program. Give this new feature a try. If you decide that you'd like to opt-out of receiving text-message reminders, that will be easy to do. Each time you receive a text message from us you'll also receive an opt-out link. Finally, the mobile homepage for each of our individual awards programs features a What Else Can I Do? Menu. Many of these links you'll also find in the Participate Menu on each of our program sites. But this menu is another easy way to access many of the functions and features our entrants and judges want to see on our sites. So what can't you do on our new mobile websites? You can't submit entries through the new Stevie Awards mobile websites, you can't (yet) apply to be a judge, and you can't (yet) perform judging. 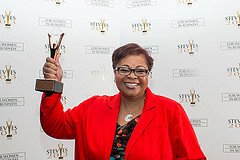 Those functions will continue to be exclusive to our desktop websites, at www.StevieAwards.com. Most tablet devices will continue to direct to our desktop sites rather than the new mobile sites, so you can always submit your entries and perform judging from a tablet, if you're on the go. Speaking of our desktop sites, they're up next on the renovation agenda. Look for our new-and-improved desktop sites to go live in January 2016. Questions about the new mobile sites? 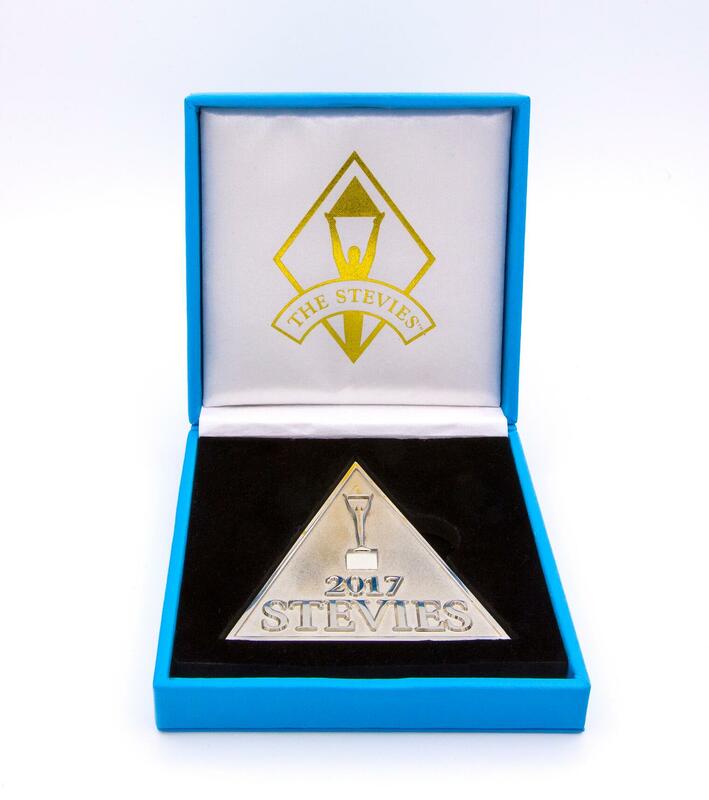 Contact us at help@stevieawards.com. Who's Coming to The American Business Awards This Friday? This Friday, September 11, the new product and technology awards banquet of The 2015 American Business Awards, the top honors in business in the U.S.A., will be staged at the Julia Morgan Ballroom in San Francisco's historic Merchants Exchange Building. Gold, Silver and Bronze Stevie® Award winners in categories for apps, new products and services, and the management of technology-industry companies will be presented. Also to be announced are the top overall honors in this year's ABAs: the Grand Stevie Award winners, for Organization of the Year, Interactive Agency of the Year, Marketing Agency of the Year, Public Relations Agency of the Year, and the Top 10. Grand Stevie Award winners have been determined by the total number of awards won in the ABAs this year, including those to be announced this Friday and those announced in Chicago this past June. 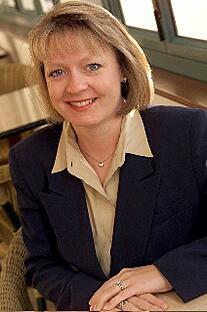 The presentations will be taped for broadcast by BizTalkRadio at 8:00 pm ET on Tuesday, September 15. Download the BizTalkRadio smartphone app to listen in! Available for iOS and Android. Here's a list of the organizations that have already reserved their tickets for Friday's awards gala. Only a handful of tickets are still available. Entries for the 2016 edition of The American Business Awards will open in October. The 11th annual Stevie® Awards for Women in Business, the world's top honors for women entrepreneurs, executives, employees, and the organizations they run, will be presented this Friday, November 14 at the Marriott Marquis Hotel in New York. 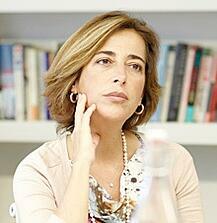 More than 400 women and their guests from around the world will attend. The presentations will be broadcast live across the U.S.A., and simulcast worldwide via the web, by Biz Talk Radio, from 7:30 pm eastern time on Friday. Listen in and follow along with a copy of the awards dinner's official program book. Finalists in the 2014 awards were announced last month. This Friday the Finalists will find out whether they've won Grand, Gold, Silver or Bronze Stevie Award status. 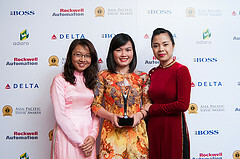 Liz Palmer Media Group Inc.
We have changed the schedule for the 2015 (second annual) Asia-Pacific Stevie Awards, the top business awards program for the region. 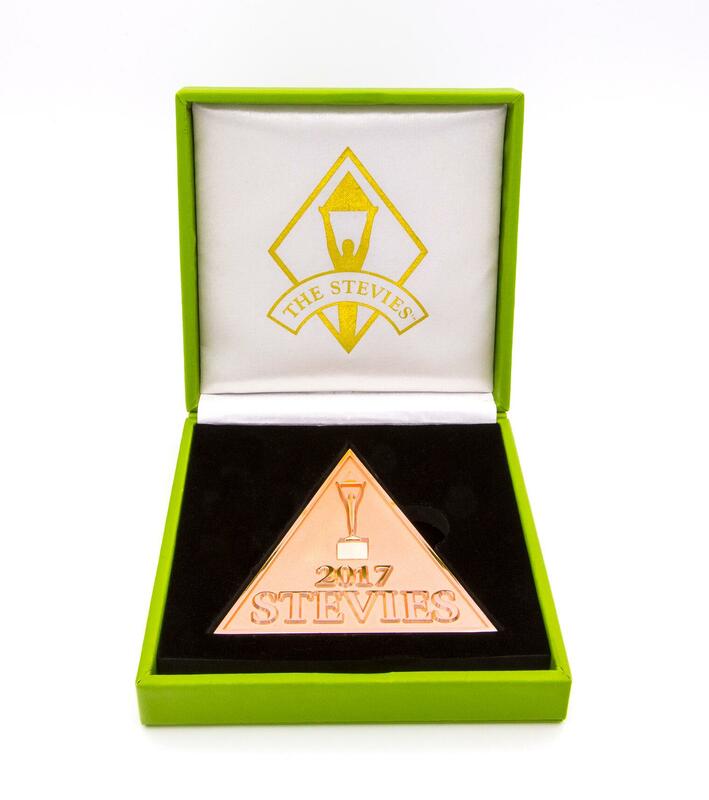 It has come to our attention that updates that were supposed to have been made to the website at http://Asia.StevieAwards.com before the opening of the awards last month were not made. It will take us about two weeks now to update the website fully. Therefore we are changing the schedule. The early-bird entry deadline with discounted entry fees, originally published as November 12, has been changed to December 3. Review the complete revised calendar for the 2015 awards. The awards are open to all organizations operating in the 22 nations of the Asia-Pacific region. We expect the website to be ready to accept your entries the week of 17 November. You may submit your 2015 entries anytime after that date. We have added many new categories to the awards, including marketing awards, PR awards, new product awards, HR awards, and more. Explore them all here. Please contact us with your questions about how to participate in the 2015 Asia-Pacific Stevie Awards.